There is a red line at the Listuguj Education Complex that can’t be missed. The line divides three classrooms from the rest of the building, creating the only English-free zone in Listuguj. Anyone crossing that line has to speak only in Mi’gmaq. The line is more than red tape on the floor. It is a compelling symbol of the protection of the Mi’gmaq language that evolved on this territory for thousands of years, but is now vulnerable. There was never such a “language line” in Listuguj. Maybe that’s the reason why in the last 50 years the English language had entered the homes, stayed there and with time, displaced Mi’gmaq as the main language. Those were the times when Canada’s assimilation policies forced Aboriginal peoples across Canada into Residential Schools and they were pushed to believe that their culture and their language were unimportant and an obstacle to progress. Today, that red line in Listuguj represents the last stronghold of resistance and decolonization. On the other side of the line there is a group of teachers and students – men, women and children – learning the language that was used to name the lakes, valleys, mountains, rivers, communities, cities, and plants on this territory. 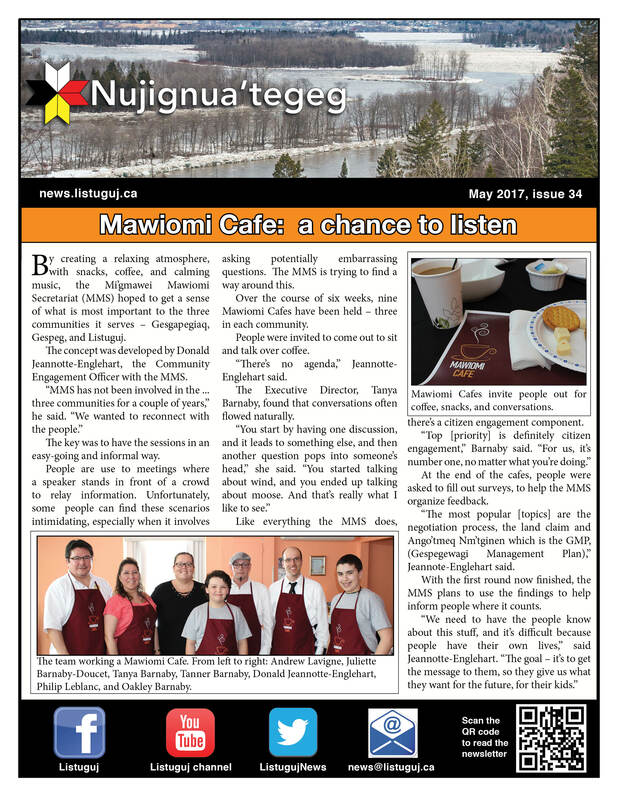 In the adult section 12 students are committed to learn the Mi’gmaq language five days a week, until March 2017. Around 800 hours of Mi’gmaq lessons in the classroom as well in the territory. This pilot project was initiated by a grant from Heritage Canada. After almost 500 years of the arrival and imposition of English and French languages, our Mi’gmaq language is at risk. According the 2010 UNESCO’s report Mi’gmaq language is considered “vulnerable,” a close step to the endangered category. However, in Listuguj there is a consensus that our language is in severe decline and it’s necessary to act now. 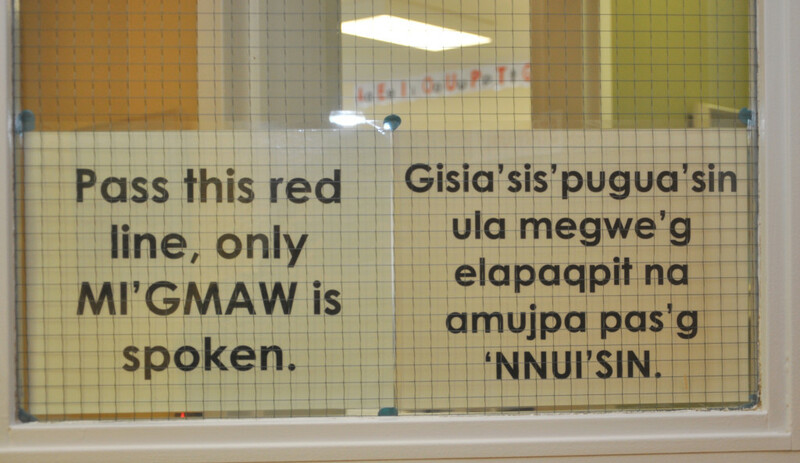 “Mi’gmaq was declared the official language of Gespe’gewa’gi, but a declaration is not enough. We need policy, language law and other initiatives to save our language”, said Lorna Sook, Director of the Listuguj Education, Training and Employment. “We did a survey and we got a lot of suggestions, ideas and we decide to strengthen the immersion programs”. One of the strategies implemented was to move the AGS Mi’gmaq immersion classes to the Education Complex, the other side of the red line and next to the adult immersion program. Nathalie Metallic requested a leave from her work at Day Care to learn Mi’gmaq. As a mother of three children she feels it’s important to pass the language on to them and eventually be able to converse with elders. She understands Mi’gmaq but like many in the community, she lacks the confidence to speak, something that an immersion program will provide. “I really want to speak it and practice at home with my kids,” she said. For Scott Isaac, his decision is about identity. “It is part of my decolonization process”, he said. “For 50 years I have been speaking the language of the colonizer and now it is time to speak the language of my ancestors.” He also sees the possibility of new job opportunities associated with knowledge of the language. 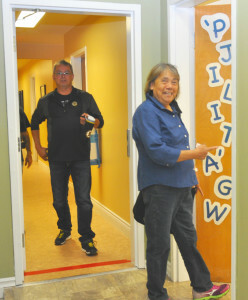 Mary Ann Metallic, Janice Vicaire and Dianne Mitchell are the instructors of the Minuignewa’tu’g ‘Gtli’sutiminu Program. 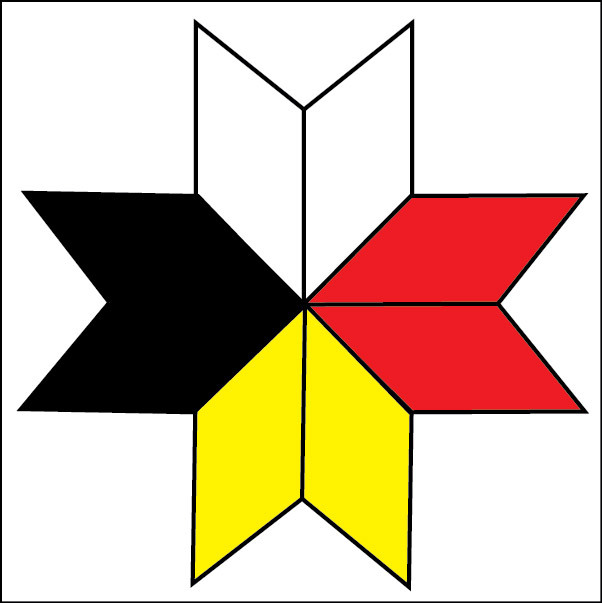 Their combined work experience for the language is associated with Mi’gmaq Online, research, summers courses, adult classes, teaching sessions at AGS, SSHS, nursery, translation, etc. They are part of a devoted group of people working in the education system. Mary Ann Metallic wishes to replicate Quebec’s measures to protect French. “They passed a law to promote the predominance of their language on public signs, at work places, at schools, at public services, etc. It worked for them.” She sees the importance of taking diverse initiatives and not only leaving the transmission of the language up to the education system. What will it take to bring back our language, who will do it? “The preservation of the language has to be the will of the community,” responded Janice Vicaire. That’s what the immersion program will recreate – a Mi’gmaq-only space in Listuguj. For Mary Ann Metallic “the red line is a symbol of resistance,” she said. “We have to get stronger for our language, we have to regroup forces, we have to isolate, and by concentrating our language in one space it will help to pass it on to the little ones. They will hear the language more often”. In fact, visiting Miss Mabel Metallic’s class next door, we can see the children surrounded by Mi’gmaq textbooks, native chants and designs. Their little voices speaking Mi’gmaq represents the hope for the survival of our Mi’gmaq language.